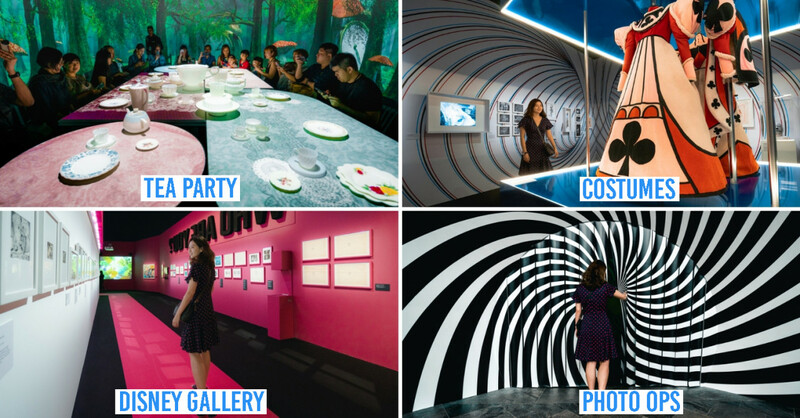 Just like how shoppers head to Bangkok and beach-goers to Bali, foodies have a mecca to call their own - Melaka. 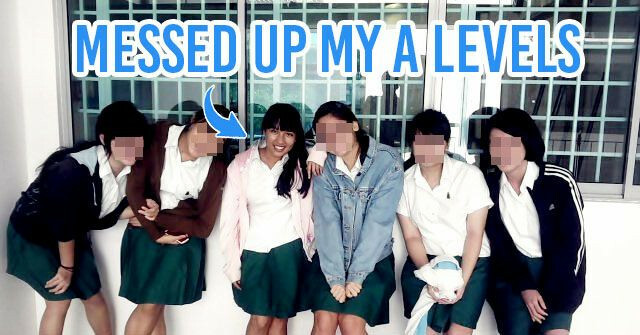 Take that, Penang! Melaka might as well be called ‘Food Haven’ for the variety of delicious food offered every time you turn a corner. Thus, it’s unsurprising how we find a new favourite stall with every visit. 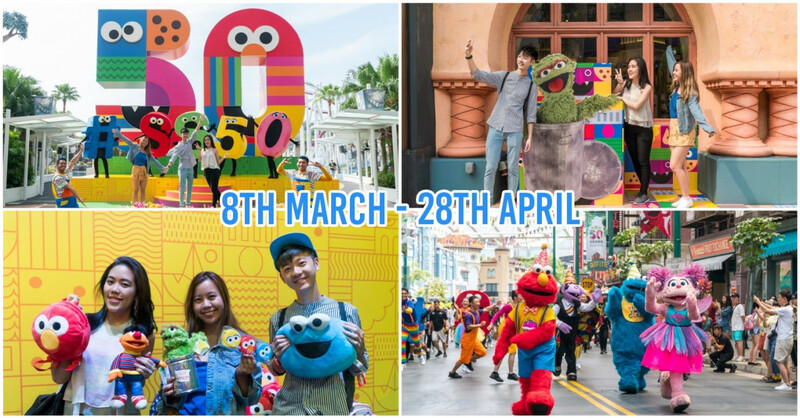 The next time you visit the state, march through Jonker Street amongst other food-filled roads and look out for delicious grubs you can get your hands on. Alternatively, tick these 11 delicacies off your food-hunting list! 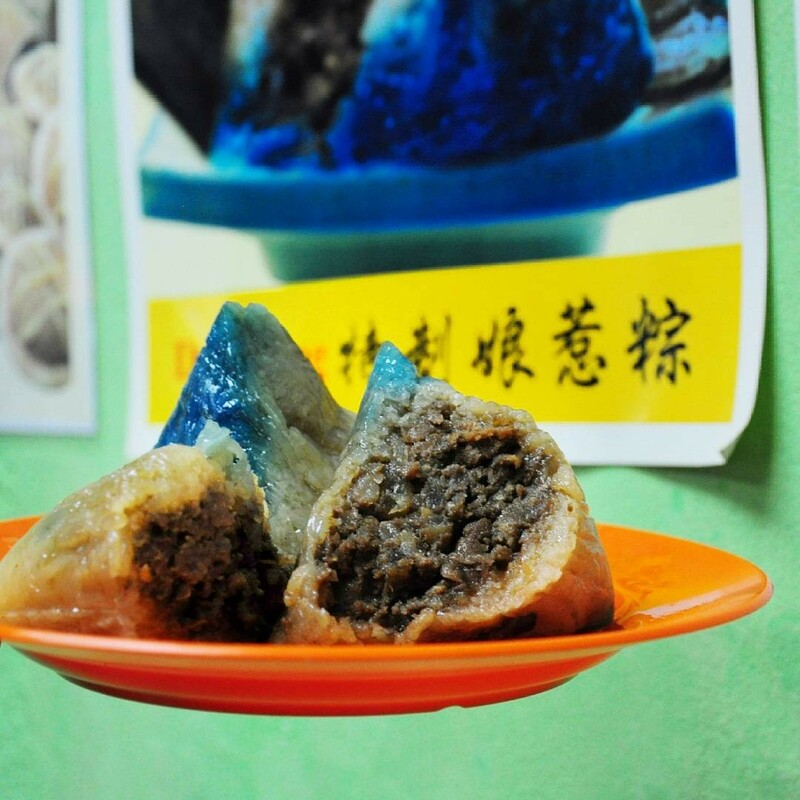 This succulent bak chang (translated from Hokkien as meat dumpling) is just as famous as Melaka’s food fame. 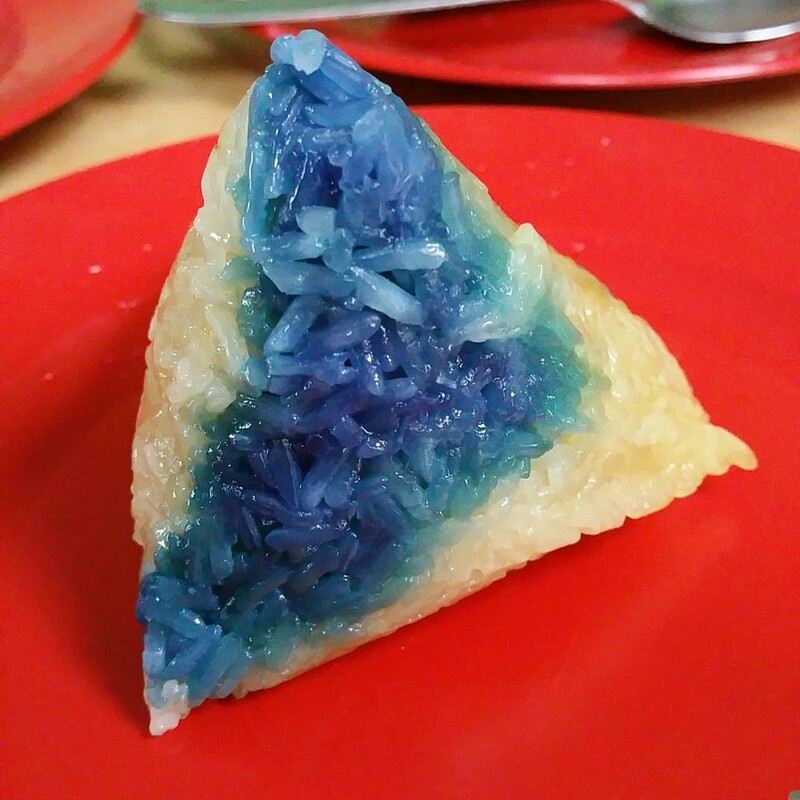 Golden-blue glutinous rice is molded and wrapped with pandan leaves and is stuffed with a savoury mix of minced pork, mushrooms and winter melon, giving this snack a perfect balance of sweet and salty. Different homemade nyonya changs have their own unique recipe to identify one from another and for this humble Melakan shop, the dumpling is tastiest when paired with its chendol. 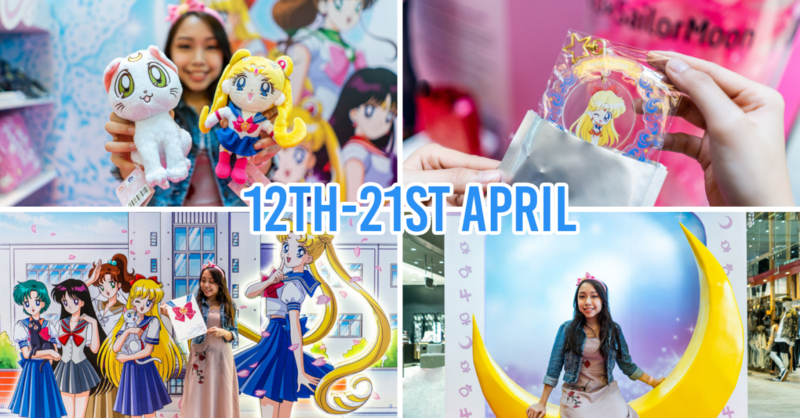 You can locate East & West Rendezvous based on the landmark of Cheng Ho Museum - the shop is right across the road. 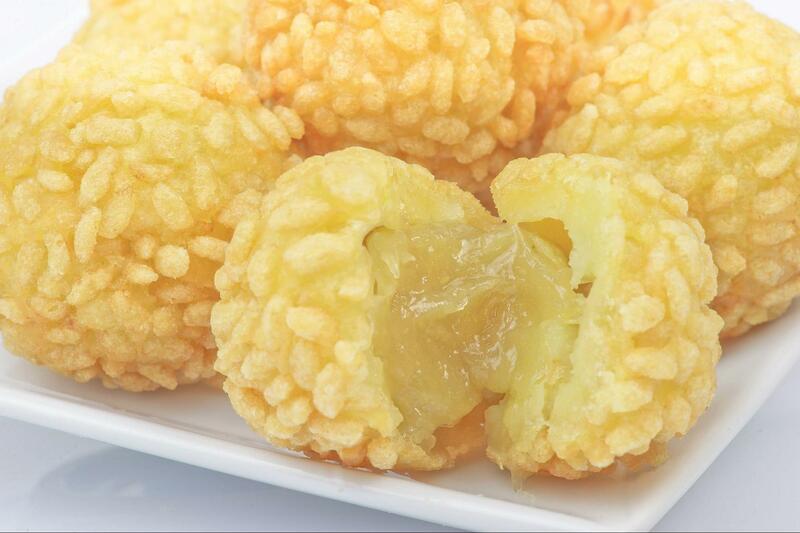 Durian bomb is the ultimate snack for durian lovers, with its crispy rice coat and the durian jam inside that melts wonderfully in every bite. It’s a crispier version of the durian custard puff! 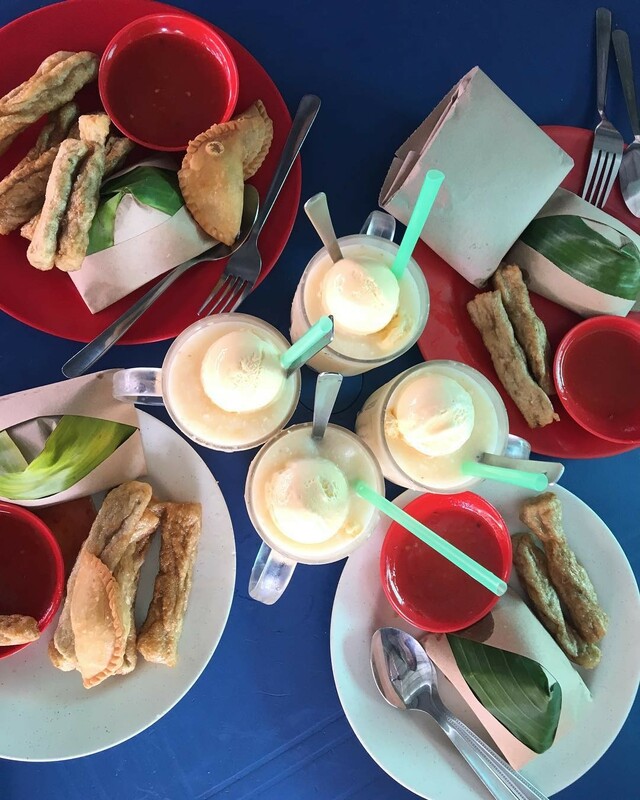 While there are plenty of durian based food within the vicinity of Jonker Walk alone, the selections at Durian Cottage are outrageous - there is nothing in the menu without durian. Even the coffee is durian-infused! This cute shop house is located only a block away from the Jonker Street night market. As enthusiastic Malaysian foodies, travelling for miles to Melaka and waiting for as long as it takes for a scrumptious Satay Celup meal at Capitol restaurant shouldn’t be a problem. 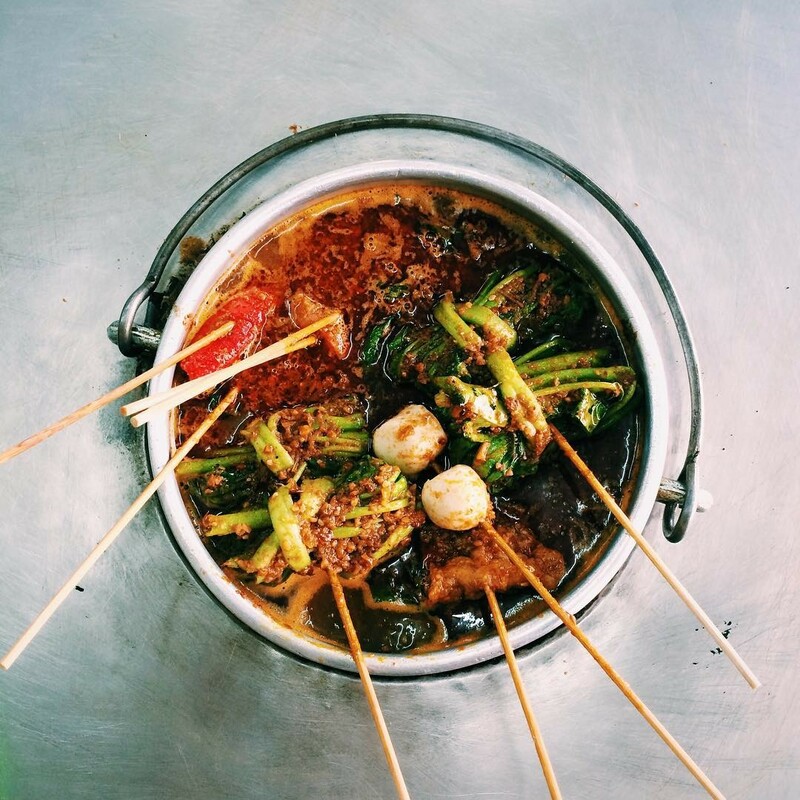 Unlike the typical Satay, Melaka’s own Satay Celup includes fresh vegetables, seafood and meat dipped in the familiar aromatic peanut sauce. This restaurant is simply one of the must-tries, and it’s sure worth re-visiting. 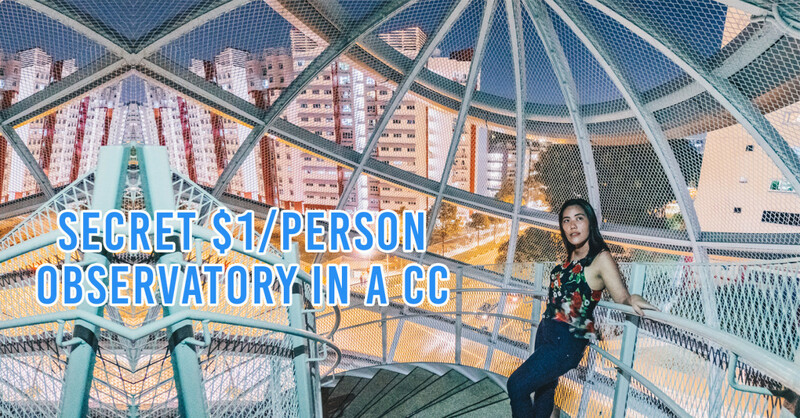 The only downside is that it’s very hard to find parking around the restaurant hence, it’s recommended that you park your car near Jonker night market and walk over. 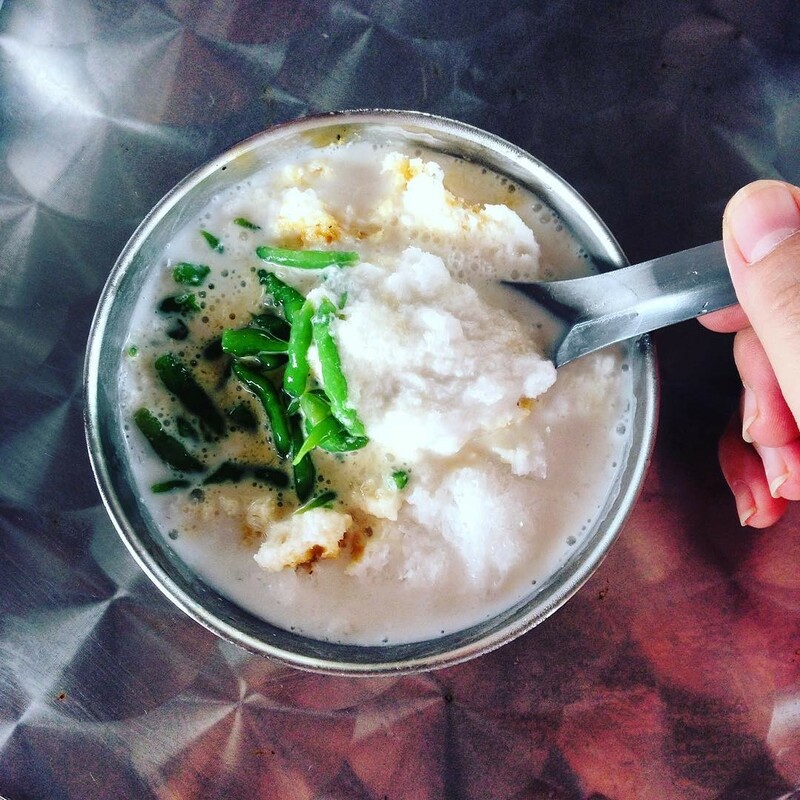 Cendol is to Melaka what chicken rice is to Ipoh, which means it's a dessert that'll fester in your regrets if you miss out on trying. 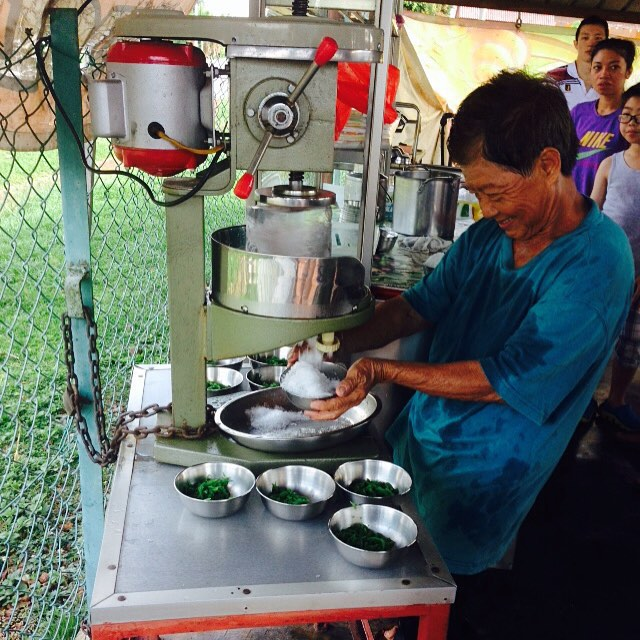 Despite having the common ingredients, Aunty Koh’s cendol is balanced in its sweetness, so you’ll not feel jelak after finishing it. Its rich gula melaka syrup blends incredibly well with the creamy coconut milk and finely-shaven ice - you won't find chunks of gula melaka ice or blocks of coconut milk ice. You will need to drive out of the city centre as Aunty Koh’s shop is a little hidden off Jalan Klebang. But don’t worry, there’s always a visible crowd at her shop for you to spot. 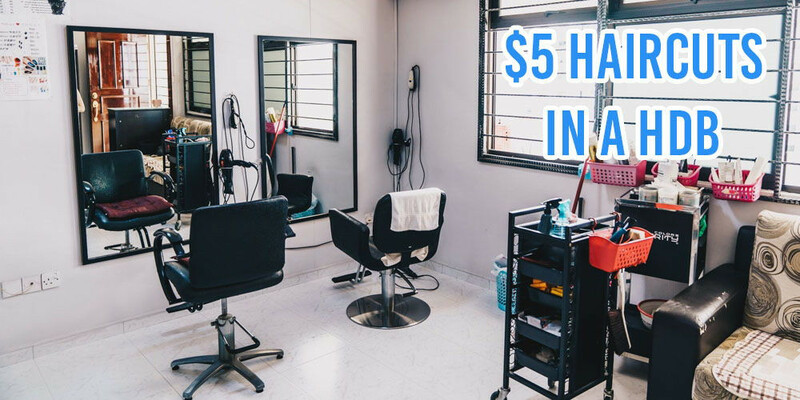 Address: 5113, Jalan Batang Tiga, Kampung Bukit Rambai, 75250, Melaka. Coconut shake shops are blooming like flowers during spring from the sweltering weather in Melaka. 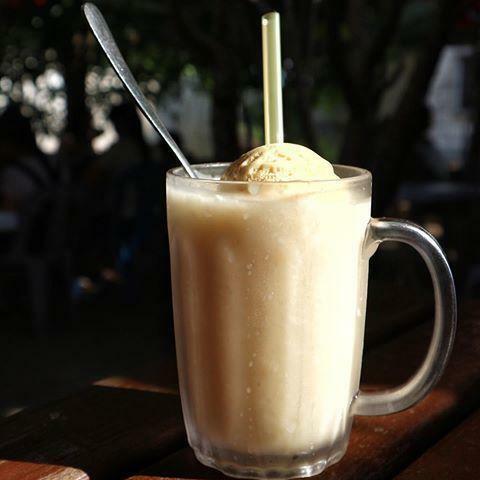 However, a distinctive stall makes this refreshing drink a real gem - Klebang Coconut Shake. 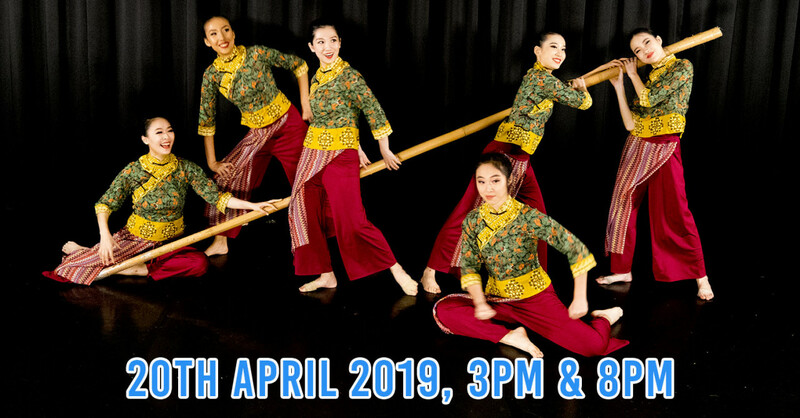 Crowds will be queuing up to dabao for an authentic taste of the concoction of fresh coconut water and its flesh, and the scoop of vanilla ice-cream that gives it a nice balance of sweetness. 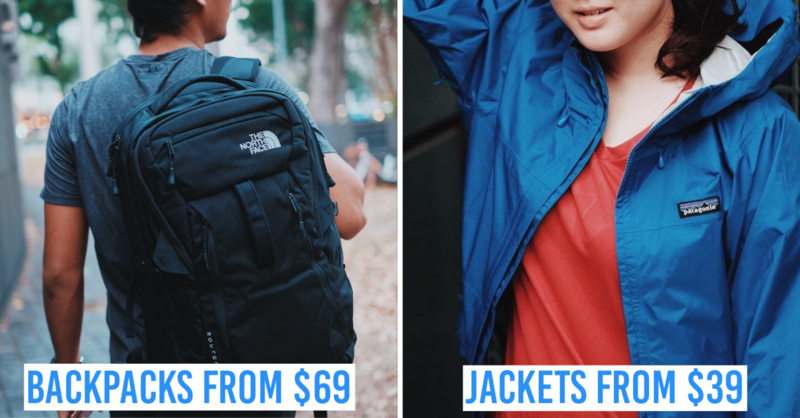 You can easily locate the stall along Jalan Klebang Besar, it’s waze-able as well. 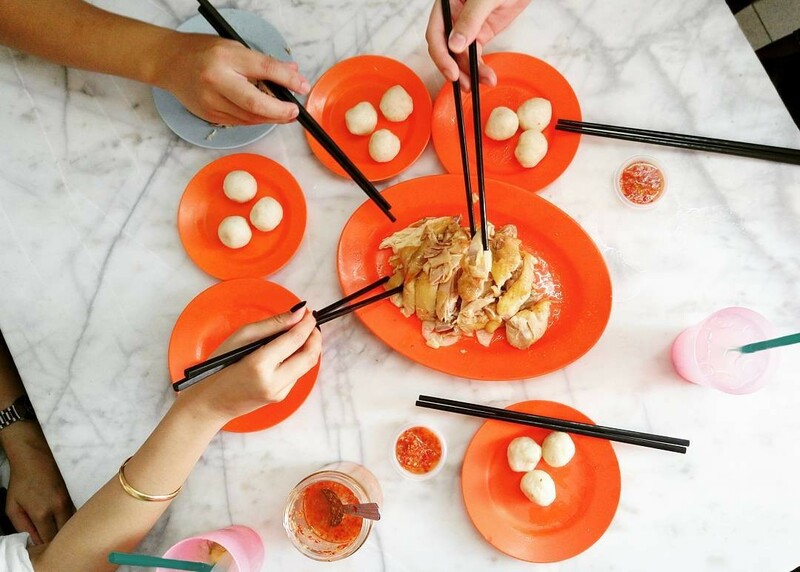 While most visitors to Melaka opt for Chicken Rice Ball as lunch priority, adventurous foodies make a detour to this age-old Dim Sum restaurant. 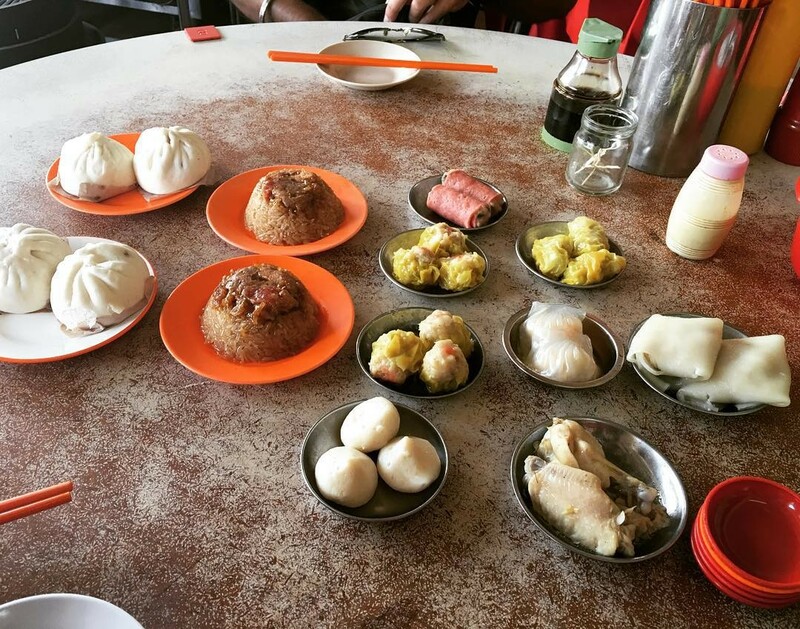 Loh Yong Moh is one of the oldest Dim Sum eatery in Melaka with a variety of paus and dumplings. 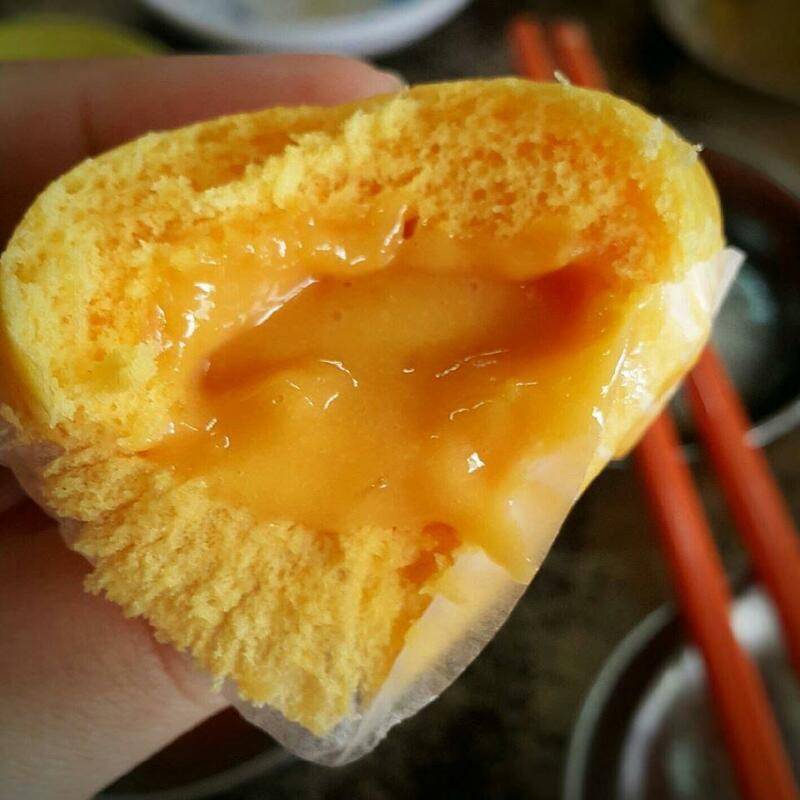 Try its yellow salted egg custard bun. The custard tones its viscosity down so be careful not to drip them after your first bite! Don't fret if it does, though. The bun has a generous filling, so it's fine to waste a bit of it for the sake of a snapshot. Loh Yong Moh Restaurant can be found near the Sri Poyyatha Vinayagar Moorthi Temple. It closes on Tuesday. 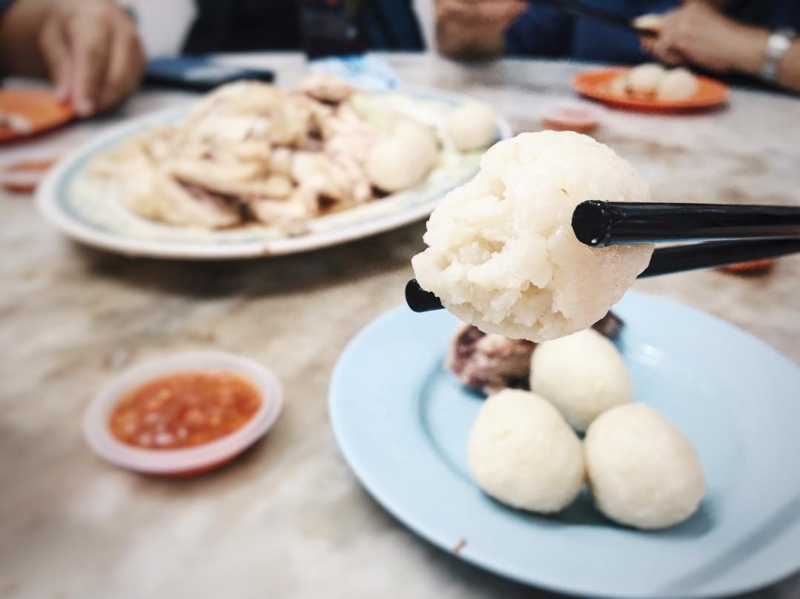 Here’s a novelty dish that's authentically Melakan - Chicken Rice Ball. Kedai Kopi Chung Wah offers one of the best of the delicacy, proven from its crowd of locals and travellers. Its fame rests upon the soft and flavourful rice balls, the tenderised steamed chicken meat and the delicate sauce. Despite the queues, there are no gimmicks in the dish that attracts the crowds - it’s just that delicious. 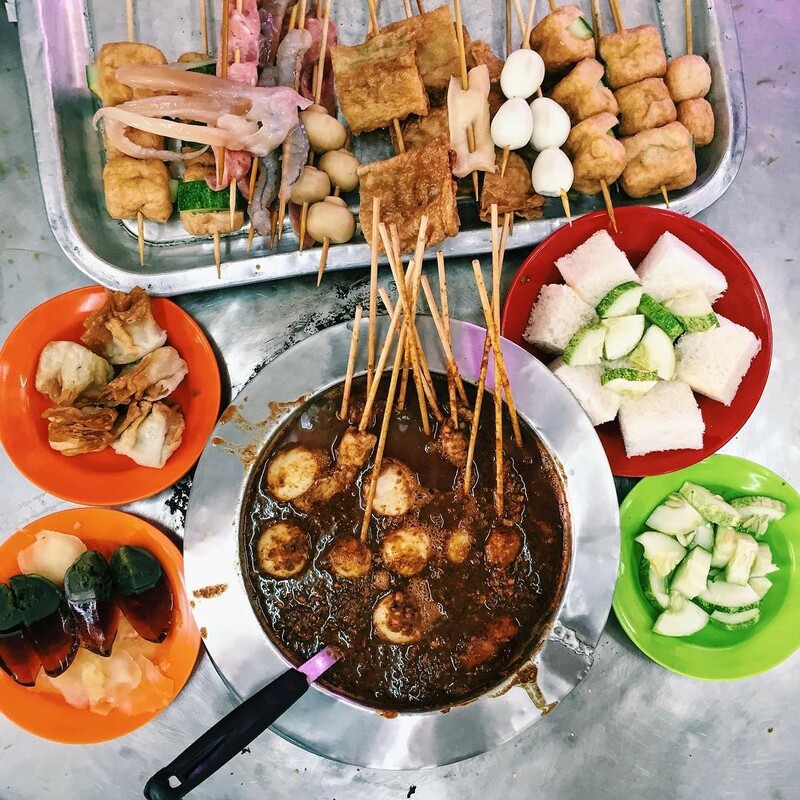 When in Melaka for a gastronomic tour, Jonker Street night market should be a destination prioritised for exploring and discovering new delicacies. 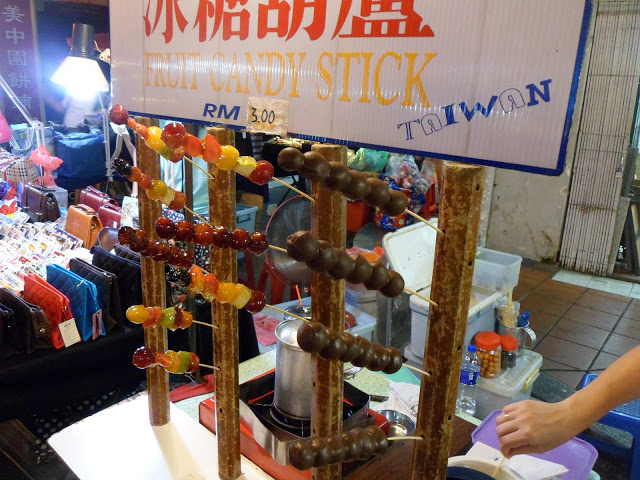 One of the hypes you shouldn’t miss out on is the sweet candied fruit skewer - it’s basically satay made of fresh fruits like grape and strawberry that are coated in syrup. The flavour may be overwhelming at first, but the fruits’ natural sour taste and sweet syrup will grow on you. Better yet, choose the chocolate coating and relive the experience of eating at a luxurious chocolate fondue buffet! 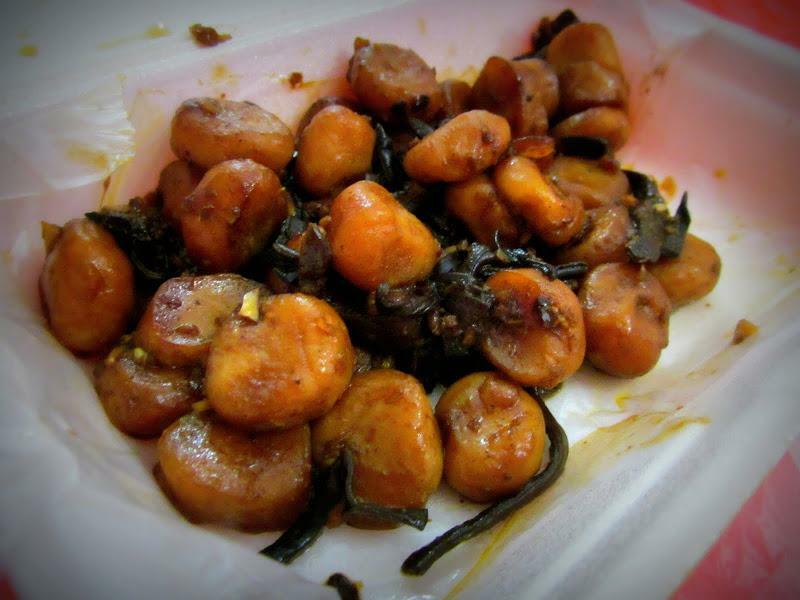 This rare yummy Hakka snack is made of stir fried tapioca and yam, with sprinkles of spring onion. It’s not difficult to guess why it bears the name ‘coin’ and ‘abacus beads’ from its resemblance to those two objects, but unlike those items, the snack has an arousing aroma when fresh from the wok. Food in Jonker Street comes in an overabundance so it'll take time to decide on the food you'd like to try if you've only got a small tummy to fill - the kind of tummy that becomes bloated from a small meal. Thus, it's wise to have snacks like Yam Coins to fill your empty stomach while exploring your food options. By now, deep frying unusual food shouldn’t sound foreign to you anymore. Heck, someone even deep fried water! However, unlike most experimental deep fried food that tastes bizarre, deep fried ice cream is delicious. 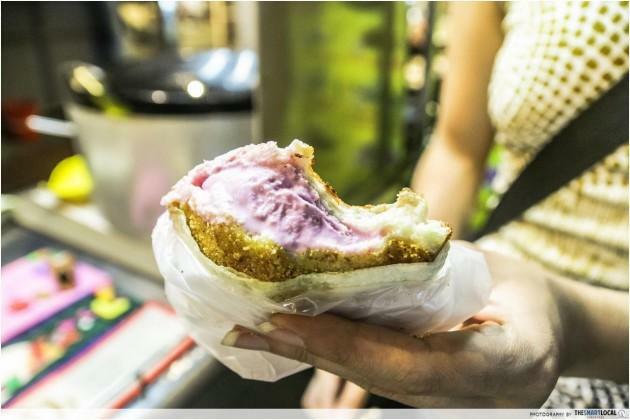 The frozen ice cream nugget is wrapped in crusty bread - a combination that’s already as perfect as Yin and Yang - and even though deep fried, you’ll still get a kick of brain freeze as you take the first bite. The snack comes in classic flavours like coconut and cookie cream so you’ll be refreshed despite finishing fried food. 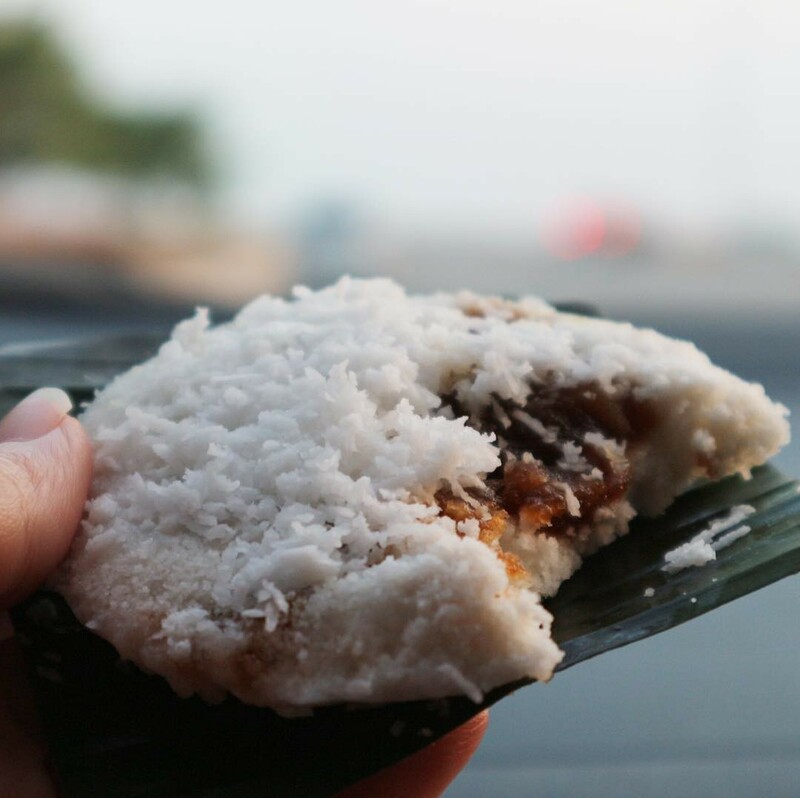 The putu piring is a simple steamed rice flour dessert, stuffed with gula melaka, giving it a familiar yet indescribable sweet and salted taste. Once you hold this piece of cake in hand, finish it while it’s still warm to enjoy its soft and warm-hearted essence because it hardens when cold, turning extra crumbly. 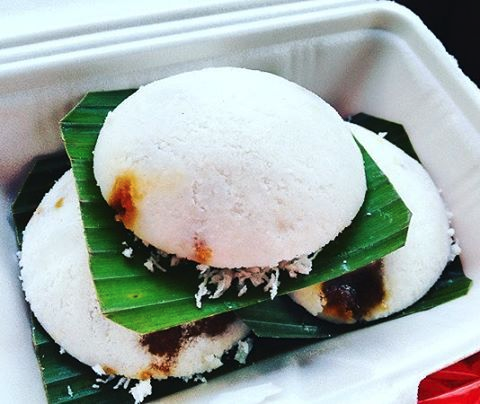 As a take-away-only snack, putu piring isn’t the easiest to eat while you’re on a Melakan food trail - it’s not on-the-go-friendly. The tasty bits of coconut shavings are prone to being littered and the crumbly texture makes messy morsels. 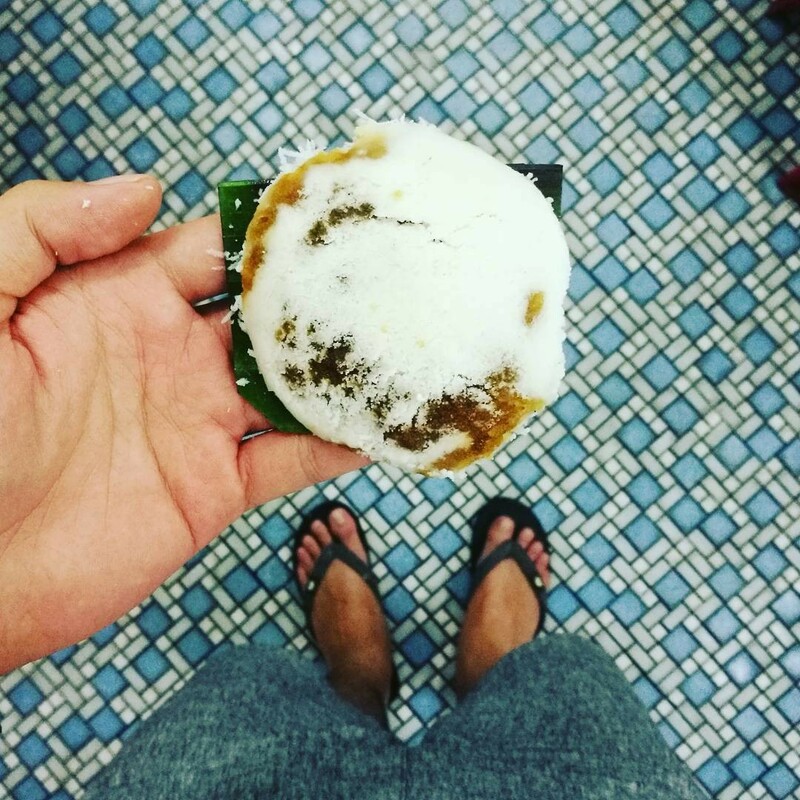 Thus, the putu piring should be a snack that you buy to complete your food hunt as you head back. You will need to drive your way to this small shophouse, located along Jalan Tengkera (walking distance to Public Bank Tengkera). 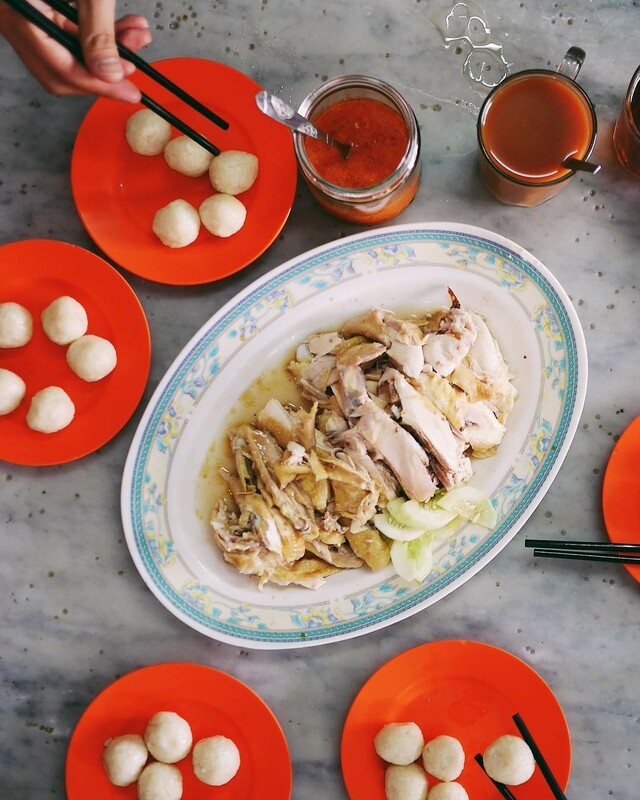 Jonker Street may have everything you need to complete your food journey, but exploring out to areas beyond the gastronomic mecca allows you to hunt for hidden stalls with food gems. Besides, locals would rather visit places that are under the radar than joining the crowd! 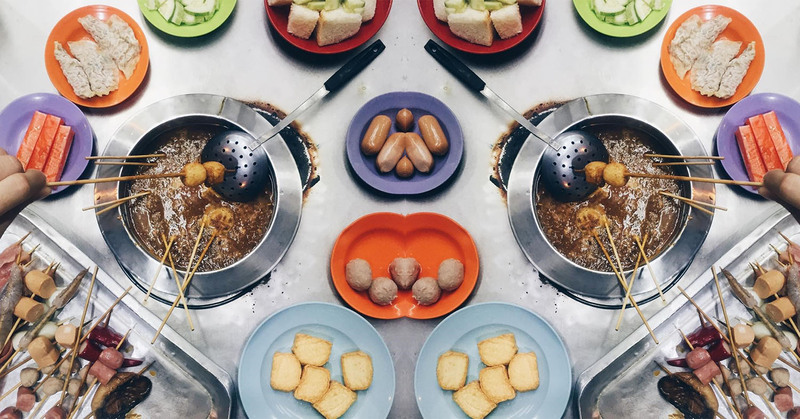 As you enjoy every slurp and bite around the city, embrace the Melakan's food culture, and learn a thing or two about the ingredients that their food encompass. The best way to experience the local cuisine is to mingle with the people behind the dishes - the ones who cook will know their food the best!